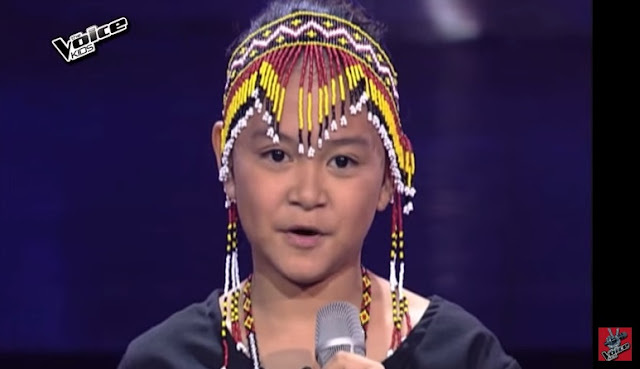 MANILA, Philippines - Manobo kid Mary Marianne "Gift" Cerna from Butuan has joined the second season of 'The Voice Kids' as shown in the blind auditions on Saturday, July 4, 2015. Gift, 10, turns red chairs of Coach Bamboo and Coach Sarah Geronimo as she sang "Malayo Pa Ang Umaga." "Parang anghel ka na kumakanta. Talaga namang pinaniwalaan ko kahit nakatalikod ako." Coach Sarah told Gift. It's a beautiful song, pero ang ganda is hearing it from a child." Coach Bamboo said. Another artist from Butuan and Voice Season 2 grand winner Jason Dy serenaded Gift to win her heart for Coach Sarah. Coach Sarah and Bamboo even battled to get the Manobo kid to their respective team. Meanwhile, Gift chose Team Sarah.